Well, the year is almost over, and I'll be heading into my second year of digital narcissism. The past couple of weeks have been a bit of a blur. Between a hectic work week and the insanity that revolves around the holidays, I'm at the point where I'm looking forward to putting December 2008 to bed. This week I've been putting our house back together after the holiday re-organization, and trying to get back on a work-out schedule. Sunday's 60-degrees was perfect for running. The trails, sadly, have not been up to par. Mike and I took off today for an optimistic ride, but we were thwarted after about two miles. The trail head looked good, but we kept alternating between deep snow (not really deep, but deep enough to make riding annoying), deep mud and water, and ice. Not great conditions. More snow is on the way tomorrow, so who knows when the trails will be ready again. I got my commuter ready for the winter weather with studded tires and fenders. Sigh, I really hate winter. I can't wait for Hawaii! Anyway, I updated some of the pics in Picasa of Gary (and of course, Luna is in there too), and I posted some more pics from Art Week (listed below). Well, another week off is in the bag, and it’s back to work again tomorrow. The weird thing is, I like my job, so heading back to work ain’t a bad thing. This past week was great as Jean was off too. As you can see below, our Saturday was good, and the rest of the week was great as well. Sunday, Jean and I went up to Manchester, NH with our friends Mike & Jo to the Courrier Museum to check out some “aht.” They had a great Warhol exhibit, and plenty of other great visuals. We also went to a Frank Lloyd Wright house. I guess, in retrospect, this week was full of art as Jean and I also went to the Griffin Museum of Photography and the De Cordova Museum of Art which is one of our favorites—and we made it up to Portland, ME for a day trip. Jean and I also stimulated the economy with both home purchases and holiday shopping. They have also hosted some great lectures and classes which is how Jean and I first got involved. The open house that we attended was to display and discuss the artistic and symbolic merits of “end papers.” End papers are the insides of books covers—the transition from exterior to interior. Look in any hardcover book and you’ll see many different styles of end papers, from maps and graphs to marbleized artistic patterns. It’s one of those things that we encounter all the time, but never think about. Of course, the main reason I went was for the free coffee and cookies. In keeping with the paper theme, a local artist was on hand to teach people how to make their own paper. Yep, starting with some unwanted paper stock and a regular blender, she created pulp, which was then turned into paper. Jean and I gave it a try too. Yep, this one was taken from the boat ramp next to the Kernwood Bridge in Salem just before I was heading in to work. It's good to have a camera on hand when you need one! I seem to have problems commuting. For the second time in about two months, I've succumbed to gravity's sweet serenade and found myself floundering on the ground while trying to commute to or from work. Last time it was a mechanical malfunction, this time, it was the dreaded--black ice. Yep, I went around a corner that only looked wet, and before I could even think, I was down. The bike went left, the right leg went out, twisted, and I went down. Technically, my right lower leg was externally rotated while my thigh was internally rotated (not good), with significant valgus flexion. Yum. I hobbled up, pedaled the last couple of miles in to work, and went about my business. I was fairly stiff, sore, and swollen by the end of the day, and my lovely wife picked me up. The next day, I was limpin' like a gimp, and I ultimately picked up a cheap cane to facilitate walking. Plus, every at the hospital got to make "House" comments to me. My biggest fear, based on the mechanism of the injury, was that I sustained some cartilage damage. I happen to be lucky enough to be friends with one of the top knee guys in the business, Dr. Ira Evans. He checked me out and felt that an MCL sprain along with some other soft tissue bruising was most likely (here is an article that Dr. Evans and I worked on for Dirt Rag discussing knee injuries). Now, two weeks later, I'm feeling better. Certainly not 100%, but I'm walking much better, I've been able to do an easy spin on the bike on the rollers and I did a short run tonight. I'm still on NSAIDs, but I think I'm on the road to recovery. I did miss some good cyclocross races, but there will be more races in my life. Anyway, the ironic part is that the day prior to the fall, I had posted a reply to the LinkedIn group for bike commuters extolling the virtues of studded tires for winter riding. I have a set sitting in my garage waiting to be mounted... Had I only taken my own advice! Oh well, needless to say, they're going on before I start back to my two-wheeled commute. So, it's been a little while since the last update. Let's get caught up. First off, over the past few weeks, I've been tailoring my work-outs to be more cyclocross oriented. Yep, using the flatbar 'cross bike, and doing short, fast rides with some running thrown in for fun. In fact, this set of stairs is particularly fun, especially because there are always people walking dogs nearby, wondering what kind of lunatic would be riding towards a set of stairs at full speed, only to dismount at the last second, shoulder the bike, and run like a lumbering lumox to the top. The real strange looks come in when I hit my second or third time up. Gary has been slowly getting more comfortable in his new home. He and Luna get along great, and the destruction has been bumped up a few notches. They tear through toys that are billed to be ultra strong. They are like furry piranha. But, the toys keep them busy and it keeps them from chewing on Jean's shins. He started obedience class and for his first time, he did fine. He did, however, vomit in the back of the Element again. Did I mention how great the rubber floors are? I haven't taken any inspiring photos lately, but with the impending holidays, perhaps I'll document the life and times of some figgy pudding. 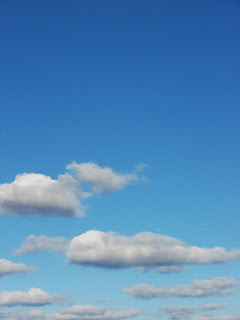 I shot this cloud pic while I was waiting for Jean as she was being a good consumer in Target. Last week I spent a little bit of time getting ready for winter. I got some gas (which is cheaper than I've seen in a long time) for my new snow thrower and started it up for the first time. This monster will be ready for the worst that New England can send my way. Yep, the hoses are shut off, the grill is in the garage, the deck furniture is taken in... I'm getting ready.